In 1989, the American political philosopher Francis Fukuyama published a famous essay which he called “The End of History”. In celebrating what he believed to be the more or less permanent triumph of liberal democracy, he saw the “free market” and democracy as not only compatible but as mutually supportive. The market was in his view the equivalent in economic terms of political democracy, achieving the same dispersal of economic power throughout society as democracy achieved in political terms. He saw no need for democracy to act as a restraint on “free-market” outcomes, and he saw no danger that the “free market” might in some ways prove inimical to effective democracy. He was confident that the rest of the world would flock to the democratic banner. Just over twenty years later, that expectation has been confounded. Confidence in democratic processes – both here and abroad – is at a low ebb. So, what has gone wrong? The seeds of the problem had already been sown by the time Fukuyama published his essay. The received wisdom of the immediate post-war years – that full employment should be the prime goal of economic policy, that collective public provision was needed to guarantee basic standards of essential services, and that market excesses would have to be restrained by careful regulation – had been replaced by new ideas. The individual, rather than society, was seen as the pivotal point of human endeavour and progress; writers like Hayek and Nozick questioned the need for or appropriateness of an extended role for government or the acceptability of meddling in “free” market solutions; redistributive taxation, the provision of taxpayer-funded benefits to the disadvantaged, and the power of organised labour came to be seen as obstacles to economic growth rather than as guarantees of an equitable distribution of wealth; economists like Milton Friedman questioned the efficacy in peacetime of Keynesian intervention and promoted the idea that macro-economic policy was really just a simple matter of controlling the money supply in order to restrain inflation; while global developments such as the oil-price shock of the early 1970s meant that inflation rather than full employment was seen as the primary issue for economic policy. Many of these ideas had been carried into government by Ronald Reagan in the United States and Margaret Thatcher in the United Kingdom. The two leaders made common cause at the beginning of the 1980s in taking a step whose significance perhaps even they did not fully grasp at the time. The portentous decision was taken in the United States and in the United Kingdom to float their currencies and to remove exchange controls. The way was now clear not only for an explosion in international trade and foreign investment, but for a determined assault by international capital on the political power of democratically elected governments across the globe. The ability to move capital at will across national boundaries not only meant that international investors could bypass national governments but also enabled them to threaten such governments that they would lose essential investment if they did not comply with the investors’ demands. This shifted the balance of power dramatically back in the direction of capital, and set the seal on the triumph of those “free-market” principles of economic policy that became known as the “Washington consensus”. It became accepted that the “free market” was infallible and that its outcomes should not be challenged. Any attempt to second-guess the market would inevitably produce worse results. Everyone – it was thought – would be better off if the rich and powerful were subject to no restraint in manipulating the market to suit their own interests. 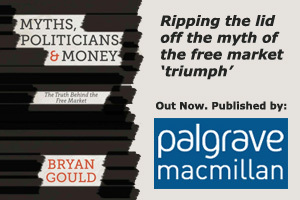 But the whole point of democracy – that the legitimacy enjoyed by elected governments allowed them to defend the interests of ordinary people against the otherwise overwhelming economic power of those who dominated the market – was thereby lost. We see the outcomes of this shift all too clearly. Virtually the whole of the increased wealth of the last three decades has gone to the richest people in our society; poverty, even in the “rich” countries, has risen while inequality, with its attendant social ills, has widened; the rights of working people at work have been weakened; joblessness is endemic; and the “free market” free-for-all achieved its culmination in the global financial crisis. A “Europe” imposed by an elite and constructed in the image and to suit the interests of international capital has come unstuck and flounders in recession and unemployment. The austerity demanded by Europe’s leaders makes a bad situation worse. Popular support for the European Union has nosedived. Major decisions continue to be made by big corporations and not by elected governments. Faith in government and the democratic process is at a low ebb and attempts to consult the people on Europe’s future continue to be resisted. “History”, in other words, has continued to unfold. Very few seem to realise how thoroughly our civilisation has been transformed by the triumph of the “free-market” ideology. They do not see that western liberalism, which has informed, supported and extended human progress for perhaps 700 years, has now been supplanted by an aggressive self-interested doctrine of the individual which leaves no room for community and cooperation. Even the victims of this comprehensive and fundamental change seem hardly aware of what has happened. Fukuyama failed to recognise, in other words, that the threat to western democracy came from within those democracies themselves. It came from the greed and self-interest of the rich and powerful and their ability to manipulate the “free” market to their own advantage, but also from the quiescence and apathy of that much greater number who fail to understand that democracy is necessarily sidelined if the market cannot be challenged. The substance of democracy has been hollowed out, so that only the shell, the forms, remain, because we have not cherished and made a reality of what was our most valuable protection and greatest achievement. Barry Baucent on The Chinese “Message”.